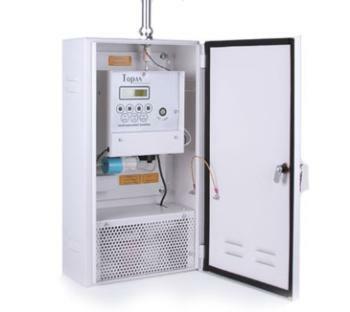 Topas (Turnkey Optical Particle Analysis System) is a fixed station monitor designed to continuously record environmental TSP, PM10, PM2.5 and PM1 particles. Topas has achieved the Environment Agencys MCERTS certification, ensuring its accuracy in recording data. The instrument is housed in a compact, unobtrusive stainless steel wall box with IP66 protection. Inlet heating is fitted as standard. All controls and displays are located behind a lockable door. Several sites can be networked together to form a city wide monitoring system. Sites can be connected by radio, telephone or GSM modems, or fixed wiring and controlled by one PC using AirQ software.